At an individual level, LondonScape aims to give agency to people, so that they can see their individual impact within the greater whole, the choices they have within that and the ability they have to affect change. What LondonScape can help bring to life is that every citizen has a degree of power to influence systems - small, isolated actions, guided by a sense of the collective big picture, can (and have) changed and evolved that very picture. At a community level, LondonScape aims to raise awareness of all the ways in which we are connected to one another and that everything we each do has some impact on everyone else. The reality is that we live in a cloud of connections that we cannot see and by making these visible, you are creating a new web of opportunity. This interconnectedness – the realization that individual action is linked to a greater purpose – will drive forward the kind of innovation the 21st century is demanding. Systems are large, complex, and daunting – as individuals, we feel our actions will effect very little change in the face of the challenges facing our society. At a societal level, LondonScape enables us to relate to one another at a mass scale. Through making visible the systems and complexity of which we are all a part and contribute to, it emphasises humility and influences collective behaviour change. 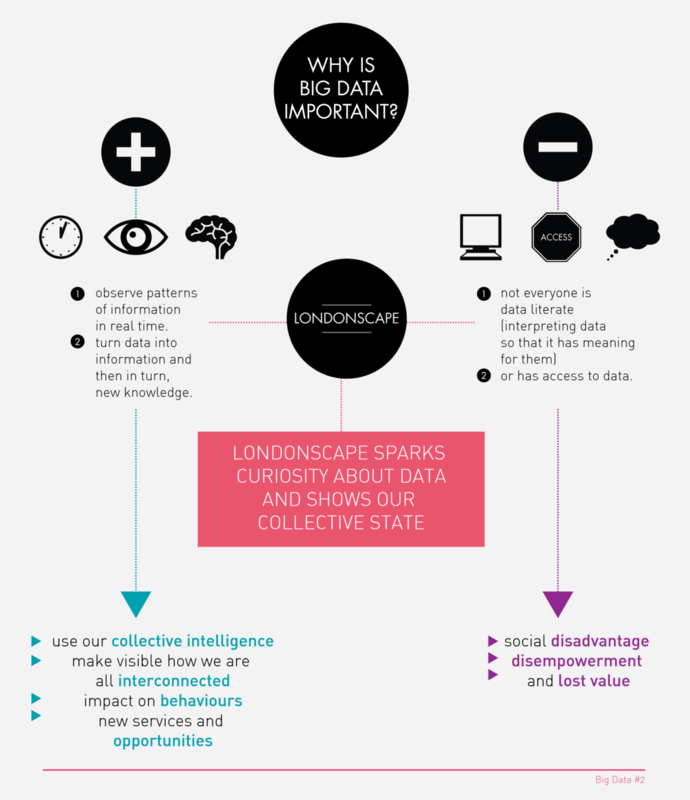 The data itself and how it is displayed could enable collective empathy and collective intelligence.